Soccerstand Livescore football results service featuring live scores, league tables and match statistics from all the major football leagues. - live, real-time scores (should be your first-choice for soccer scores). Live Score & Match Results: Soccerstand.com Visit Soccerstand.com your livescore and live score football results service. Basports.com's PREFERRED soccer score site. BBC SPORT | Football Visit BBC Sport for all the action as it happens - up-to-the-minute news. World Soccer - Yahoo! Sports Scores, news, standings, stats, and schedules. World Soccer.com Online edition of World Soccer magazine. Find international soccer news, player profiles, league standings, and information about competitions like the World Cup. World Soccer News - About.com Covers international soccer news with previews and results. BigSoccer.com Soccer discussion boards, news, Internet guide, chat, and more. SoccerTimes Original soccer news, results, polls, and more. Soccer-Sites.com Directory of soccer related sites from around the world. Soccerphile.com Includes news, fixtures, venues and city guides, travel information, and more. LiveScore.com Provides current football (soccer) scores and sports news links for World Cup, ice hockey, and tennis. Includes results from sporting events in more than 50 countries. Goal.com Soccer (football) news and commentary from around the world, served up in multiple languages. Football 365 All the latest football news and gossip from the U.K. Premier soccer scene, plus European round-ups, match reports, standings, and competitions. Teamtalk Latest football news covering all professional U.K. teams and selected world and European clubs. SoccerWay.com Offers live scores, results, tables,statistics, and news. Soccer Statistics Stats, results and forecast (results predictions) in professional leagues worldwide. SoccerAssociation.com Includes news and squad information for clubs all over the world. Tribal Football News A comprehensive analysis of soccer news headlines from around the world. Scores Pro Get live soccer scores and sports results in real time. FinalWhistle Comprehensive guide to football in Europe and around the world, including coverage of the European Leagues and Cup Competitions. News from the world of soccer. 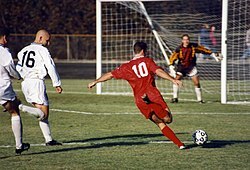 Soccer Fans Info Provides information on various topics related to soccer such as the history of soccer, rules, famous players, statistics, and training guides. Football Rumours Rounds up the latest football news and rumors. LiveGoals.com Live soccer scores, stats, and in-play commentary from all the big European football leagues. Eyefootball Get the latest news and soccer updates on the Premiership, Serie A, La Liga, Bundesliga, and World Cup. World Soccer Daily Talk radio show dedicated to world soccer leagues and tournaments around the globe. Hear what Nick and Stephen have to say about the English Premier League, Champions League, and international soccer. Top Soccer Clips Soccer videos of the top professional players in the world, updated daily. The Global Game Monthly magazine looking at the latest football news. LiveScore360 Live scores, results, and updates for worldwide soccer matches in real time. Football Issue Features the latest football news from around the globe. Includes videos, games, and discussion forum. Football Club History Database Offers a brief statistical breakdown of the history of football clubs in England and Wales. World Cup History Statistics, winners, stadiums, and legends of the World Cup tournaments since 1930. Soccerlinks Directory of global football sites. History of the FIFA World Cup User-generated article about the history of the FIFA World Cup international soccer competition, which began in 1928. Playerhistory.com Worldwide historical soccer statistics on players and matches. An attacking player (No 10) attempts to kick the ball past the goalkeeper to score a goal. A goalkeeper saving a close range shot from inside the penalty area. Football is played in accordance with a set of rules known as the Laws of the Game. The game is played using a single spherical ball, known as the football. Two teams of eleven players each compete to get the ball into the other team's goal (between the posts and under the bar), thereby scoring a goal. The team that has scored more goals at the end of the game is the winner; if both teams have scored an equal number of goals then the game is a draw. The primary rule is that players (other than goalkeepers) may not deliberately handle the ball with their hands or arms during play (though they do use their hands during a throw-in restart). Although players usually use their feet to move the ball around, they may use any part of their bodies other than their hands or arms. Within normal play, all players are free to play the ball in any direction and move throughout the pitch, though the ball cannot be received in an offside position. In typical game play, players attempt to create goal scoring opportunities through individual control of the ball, such as by dribbling, passing the ball to a team-mate, and by taking shots at the goal, which is guarded by the opposing goalkeeper. Opposing players may try to regain control of the ball by intercepting a pass or through tackling the opponent in possession of the ball; however, physical contact between opponents is restricted. Football is generally a free-flowing game, with play stopping only when the ball has left the field of play or when play is stopped by the referee. After a stoppage, play recommences with a specified restart. At a professional level, most matches produce only a few goals. For example, the 2005–06 season of the English Premier League produced an average of 2.48 goals per match. The Laws of the Game do not specify any player positions other than goalkeeper, but a number of specialised roles have evolved. Broadly, these include three main categories: strikers, or forwards, whose main task is to score goals; defenders, who specialise in preventing their opponents from scoring; and midfielders, who dispossess the opposition and keep possession of the ball in order to pass it to the forwards on their team. Players in these positions are referred to as outfield players, in order to discern them from the single goalkeeper. These positions are further subdivided according to the area of the field in which the player spends most time. For example, there are central defenders, and left and right midfielders. The ten outfield players may be arranged in any combination. The number of players in each position determines the style of the team's play; more forwards and fewer defenders creates a more aggressive and offensive-minded game, while the reverse creates a slower, more defensive style of play. While players typically spend most of the game in a specific position, there are few restrictions on player movement, and players can switch positions at any time. The layout of a team's players is known as a formation. Defining the team's formation and tactics is usually the prerogative of the team's manager. Games revolving around the kicking of a ball have been played in many countries throughout history. According to FIFA, the "very earliest form of the game for which there is scientific evidence was an exercise of precisely this skilful technique dating back to the 2nd and 3rd centuries BC in China (the game of cuju)." Various forms of football were played in medieval Europe, though rules varied greatly by both period and location. The laws of the game are currently determined by the International Football Association Board (IFAB). The Board was formed in 1886 after a meeting in Manchester of The Football Association, the Scottish Football Association, the Football Association of Wales, and the Irish Football Association. The world's oldest football competition is the FA Cup, which was founded by C. W. Alcock and has been contested by English teams since 1872. The first official international football match took place in 1872 between Scotland and England in Glasgow, again at the instigation of C. W. Alcock. England is home to the world's first football league, which was founded in Birmingham in 1888 by Aston Villa director William McGregor. The original format contained 12 clubs from the Midlands and the North of England. The Fédération Internationale de Football Association (FIFA), the international football body, was formed in Paris in 1904 and declared that they would adhere to Laws of the Game of the Football Association. The growing popularity of the international game led to the admittance of FIFA representatives to the International Football Association Board in 1913. The board currently consists of four representatives from FIFA and one representative from each of the four British associations. In competitions using two-legged matches, each team competes at home once, with an aggregate score from the two matches deciding which team progresses. Where aggregates are equal, the away goals rule may be used to determine the winners, in which case the winner is the team that scored the most goals in the leg played away from home. If the result is still equal, kicks from the penalty mark are usually required, though some competitions may require a tied game to be replayed. The referee may punish a player or substitute's misconduct by a caution (yellow card) or sending-off (red card). A second yellow card at the same game leads to a red card, and therefore to a sending-off. If a player has been sent-off, no substitute can be brought on in their place. Misconduct may occur at any time, and while the offences that constitute misconduct are listed, the definitions are broad. In particular, the offence of "unsporting behaviour" may be used to deal with most events that violate the spirit of the game, even if they are not listed as specific offences. A referee can show a yellow or red card to a player, substitute or substituted player. Non-players such as managers and support staff cannot be shown the yellow or red card, but may be expelled from the technical area if they fail to conduct themselves in a responsible manner. The major international competition in football is the World Cup, organised by FIFA. This competition takes place over a four-year period. More than 190 national teams compete in qualifying tournaments within the scope of continental confederations for a place in the finals. The finals tournament, which is held every four years, involves 32 national teams competing over a four-week period. The 2006 FIFA World Cup took place in Germany; in 2010 it will be held in South Africa. There has been a football tournament at every Summer Olympic Games since 1900, except at the 1932 games in Los Angeles. Before the inception of the World Cup, the Olympics (especially during the 1920s) had the same status as the World Cup. Originally, the event was for amateurs only, however, since the 1984 Summer Olympics professional players have been permitted, albeit with certain restrictions which prevent countries from fielding their strongest sides. Currently, the Olympic men's tournament is played at Under-23 level. In the past the Olympics have allowed a restricted number of over-age players per team; but that practice will cease in the 2008 Olympics. The Olympic competition is not generally considered to carry the same international significance and prestige as the World Cup. A women's tournament was added in 1996; in contrast to the men's event, full international sides without age restrictions play the women’s Olympic tournament. It thus carries international prestige considered comparable to that of the FIFA Women's World Cup. Two players trying to win the ball. Some countries' top divisions feature highly paid star players; in smaller countries and lower divisions, players may be part-timers with a second job, or amateurs. The five top European leagues—Serie A (Italy), La Liga (Spain), the Premier League (England), the Bundesliga (Germany) and Ligue 1 (France)—attract most of the world's best players and each of the leagues has a total wage cost in excess of £600 million. ^ Guttman, Allen. "The Diffusion of Sports and the Problem of Cultural Imperialism". in Eric Dunning, Joseph A. Maguire, Robert E. Pearton. The Sports Process: A Comparative and Developmental Approach. Champaign: Human Kinetics. pp. p129. ISBN 0880116242. "the game is complex enough not to be invented independently by many preliterate cultures and yet simple enough to become the world's most popular team sport". ^ Dunning, Eric. "The development of soccer as a world game". Sport Matters: Sociological Studies of Sport, Violence and Civilisation. London: Routledge. pp. p103. ISBN 0415064139. "During the twentieth century, soccer emerged as the world's most popular team sport". ^ "Soccer Popularity In U.S.", KXAN (2006-06-12). Retrieved on 26 January 2008. "Soccer is easily the most popular sport worldwide, so popular that much of Europe practically shuts down during the World Cup." ^ "Team Sports". Catastrophic Injuries in High School and College Sports. Champaign: Human Kinetics. pp. p57. ISBN 0873226747. "Soccer is the most popular sport in the world, and its popularity is growing in the United States. It has been estimated that there were 22 million soccer players in the world in the early 1980s, and that number is increasing. In the United States soccer is now a major sport at both the high school and college levels". ^ a b c "Laws of the game (Law 12)". FIFA. Retrieved on 2007-09-24. ^ a b c "Laws of the game (Law 8)". FIFA. Retrieved on 2007-09-24. ^ "England Premiership (2005/2006)". Sportpress.com. Retrieved on 2007-06-05. ^ a b "Laws of the game (Law 3–Number of Players)". FIFA. Retrieved on 2007-09-24. ^ "Positions guide, Who is in a team?". BBC. Retrieved on 2007-09-24. ^ "Formations". BBC Sport. Retrieved on 2007-09-24. ^ "History of Football". FIFA. Retrieved on 2006-11-20. ^ Harvey, Adrian (2005). Football, the first hundred years. London: Routledge. pp. pp.126. ISBN 0415350182. ^ Winner, David (2005-03-28). "The hands-off approach to a man's game", The Times. Retrieved on 7 October 2007. ^ a b "History of the FA". Football Association website. Retrieved on 2007-10-09. ^ "The History Of The Football League". Football League website. Retrieved on 2007-10-07. ^ Ingle, Sean and Barry Glendenning (2003-10-09). "Baseball or Football: which sport gets the higher attendance? ", Guardian Unlimited. Retrieved on 5 June 2006. ^ "TV Data". FIFA website. Retrieved on 2007-09-02. ^ Dart, James and Paolo Bandini (2007-02-21). "Has football ever started a war?". The Guardian. Retrieved on 2007-09-24. ^ Daniel W. Drezner (2006-06-04). "The Soccer Wars", The Washington Post, p. B01. Retrieved on 21 May 2008. ^ "Laws Of The Game". FIFA. Retrieved on 2007-09-02. ^ "Laws of the game (Law 4–Players' Equipment)". FIFA. Retrieved on 2007-09-24. ^ "Laws of the game (Law 3–Substitution procedure)". FIFA. Retrieved on 2007-09-24. ^ "Laws of the game (Law 5–The referee)". FIFA. Retrieved on 2007-09-24. ^ Summers, Chris (2004-09-02). "Will we ever go completely metric?". BBC. Retrieved on 2007-10-07. ^ "Laws of the game (Law 1.1–The field of play)". FIFA. Retrieved on 2007-09-24. ^ "Laws of the game (Law 1.4–The Field of play)". FIFA. Retrieved on 2007-09-24. ^ "Laws of the game (Law 1.3–The field of play)". FIFA. Retrieved on 2007-09-24. ^ "Laws of the game (Law 7.2–The duration of the match)". FIFA. Retrieved on 2007-09-24. ^ Collett, Mike (2004-07-02). "Time running out for silver goal". Reuters. Retrieved on 2007-10-07. ^ "Laws of the game (Law 15–The Throw-in)". FIFA. Retrieved on 2007-10-14. ^ "Laws of the game (Law 16–The Goal Kick)". FIFA. Retrieved on 2007-10-14. ^ "Laws of the game (Law 17–The Corner Kick)". FIFA. Retrieved on 2007-10-14. ^ a b "Laws of the game (Law 13–Free Kicks)". FIFA. Retrieved on 2007-10-14. ^ "Laws of the game (Law 14–The Penalty Kick)". FIFA. Retrieved on 2007-10-14. ^ "The History of Offside". Julian Carosi. Retrieved on 2006-06-03. ^ "2010 FIFA World Cup South Africa". FIFA World Cup website. Retrieved on 2007-10-07. ^ "Football - An Olympic Sport since 1900". IOC website. Retrieved on 2007-10-07. ^ "Organising Committee strengthens FIFA Club World Cup format". FIFA (2007-08-24). Retrieved on 2007-10-07. ^ "Premier League conquering Europe". BBC News (2008-03-31). Retrieved on 2008-05-27. ^ Taylor, Louise (2008-05-29). "Leading clubs losing out as players and agents cash in". The Guardian. Retrieved on 2008-11-28. ^ Blain, Rebecca. "The World's Most Beloved Sport - The History of Soccer". fussballportal.de. Retrieved on 2007-10-07. ^ "FIFA Statutes" (PDF). FIFA. Retrieved on 2007-10-07.